The recent controversy about sales tax exemptions for certain citizens and businesses will be addressed by the City of Tallahassee in two different venues this week. And then on Wednesday, at the regular scheduled City Commission meeting, the full City Commission is scheduled to get an update from Reese Goad, of the Utility Business and Customer Service Department. The issue is listed under agenda item 13.04. The issue, first brought to light by Dr. Erwin Jackson at the March 27th City Commission, involves the collection of sales tax on electricity by the City of Tallahassee from citizens and businesses that, according to Florida law, are exempt and should not be paying the tax. Dr. Jackson claims collecting the tax is illegal and the City is stealing money from its citizens. Dr. Jackson renewed his claims at a local town hall meeting on Thursday in the presence of elected officials. 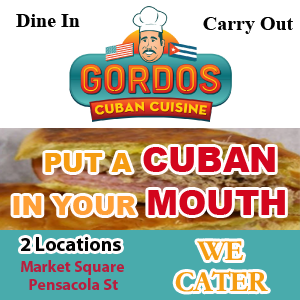 City Commissioner Gillum responded by saying the staff was looking into the issue and City Commissioner Miller stated that the city is obligated to collect sales taxes and said the only way the city could not collect them is if the state issues a business an exemption certificate, which has to be requested and approved. Research by Tallahassee Reports on the issue has revealed the following facts. First, Commissioner Miller’s statement is not completely accurate. There are exemptions, such as for churches and non-profits that do require an exemption certificate that is issued by the state of Florida. However, there are other exemptions, such as for manufacturing businesses, apartment complexes, condominiums, and homeowner associations that require paperwork that can be provided directly to citizens by the City of Tallahassee without contacting the state of Florida. Second, part of the controversy revolves around the allegation that the City of Tallahassee has not been proactive in providing information that would help save money for its customers, and thus, help the local economy. Tallahassee Reports researched which utilities provide information about the exemptions by doing a simple google search. 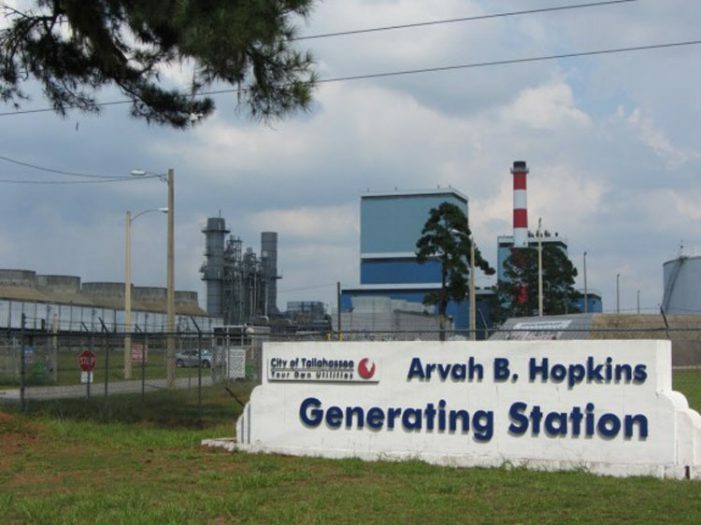 The results indicate that access to information on the exemptions is readily available on websites for FP&L, Progress Energy, Gulf Power, Jacksonville Electric Authority, and Lakeland Electric. The information provided by JEA, a city owned utility, is provided below. Information about the exemptions could not be found through a google search on the websites for Gainesville Regional Electric, TECO, and the City of Tallahassee. Third, some have alluded to the fact that the City of Tallahassee does not financially gain by collecting the state sales tax since the collected tax is simply passed on to the state. However, since the state has a “Half-Cent Sales Tax Program” that the City of Tallahassee participates in, it would appear the city may benefit from increased sales tax. This issue is still being researched. Continue to visit TallahasseeReports.com for further research and updates on this issue. 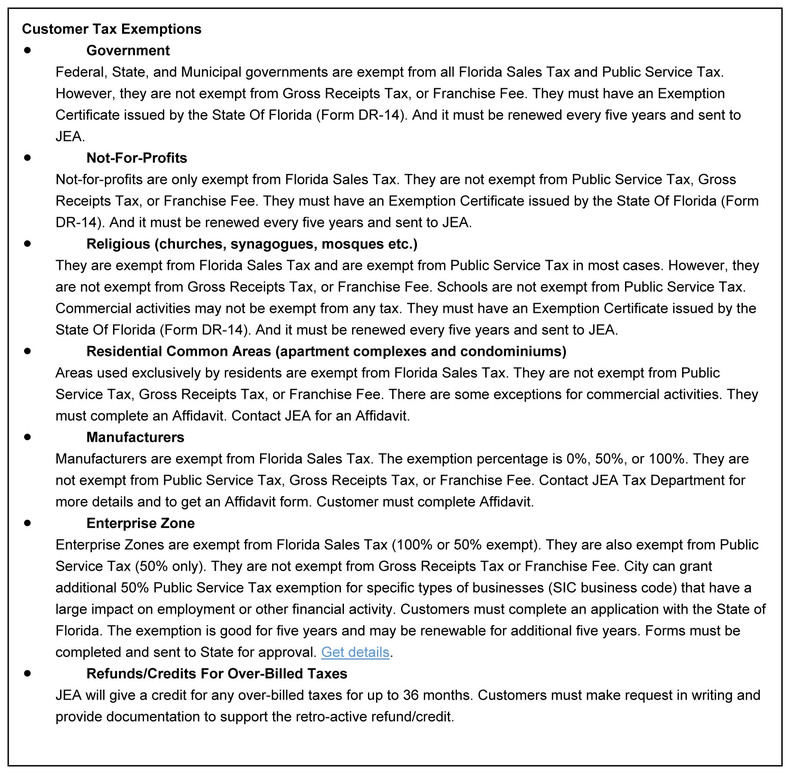 2 Responses to "Facts About The Sales Tax Exemptions On Electricity Controversy"
the tax refund form I got from Dr Jackson states that the claim can only be allowed for purchases within the last 5 years. Where does this 3 year limit come from? The City told me they would repay only three years. My $5400 check was for three years. I saw the 5 years on the document that you received and I have seen that they can not pay any “mistakes” before 1985. Great questions! Now come to city hall and ask our elected officials. This community has to stand together for what is right!